Color(s): A variety of solid colors that include black, cream, apricot, and blue. 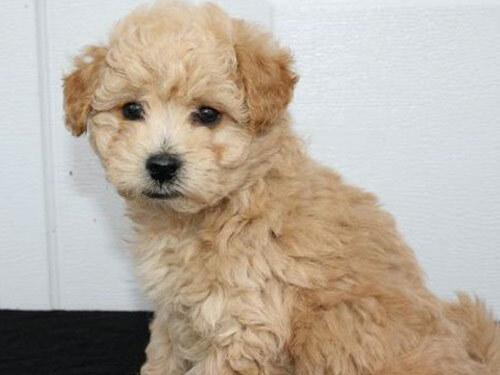 The Bich poo, also known as the Poo chon, is created by the crossing of two breeds: Bichon Frise and Poodle. They are commonly referred to as "designer dogs" and have become popular companions. The ideal Bich poo should be robust, well-proportioned, and hardy. They are small in stature, possess a sturdy appearance, and exhibit a sweet expression. Affectionate, friendly, and loyal, the Bich poo is spirited and has a pleasing personality. They do best in a home with older, considerate children or with children they have been with from puppyhood. They are suitable for homes with dogs, cats, and other household pets. Bich poo's are suspicious of strangers and will bark to alert their family to visitors or out of the ordinary sounds. The coat of the Bich poo requires frequent brushing and professional clipping to prevent matting and tangling. Bathing should be done when necessary. It is important to keep the ears clean to prevent infection. Dental hygiene is important to prevent early tooth loss. Bich Poo's may be prone to such health issues as PRA, epilepsy, diabetes, cataracts, and skin disorders. Loosely curled and may be wooly or coarse in texture. The Bich poo may be difficult to housetrain. The crate training method works best. Early socialization and obedience are recommended. They will not respond to harsh or heavy-handed methods. Training must be done with firmness, fairness, patience, and consistency. The Bich poo is well-suited for city and apartment living. They thrive on family interaction, securely leashed walks, and off-lead play time in a securely fenced yard.